Animals are successfully being used to treat Schizophrenia and bipolar disorder at a Manchester hospital. 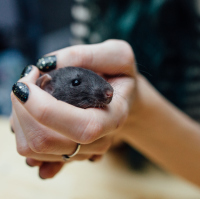 A seven-week "animal magic" course of therapy uses dogs, rabbits and rats to treat patients with severe and long-term mental health conditions at North Manchester General Hospital. Noah's ART (Animal Rescue Therapy) assists people in opening up about their problems. Anyone with long-term mental health issues is reminded of the importance of pre-existing medical travel insurance. Sharon Hall, 54, who set up the scheme, says: "A lot of the time the animals can be a real comfort - and the simple physical connection of holding or cuddling an animal can bring profound relaxation even at a time of major mental or emotional anguish." Noah's Art is one of 35 mental health and well-being initiatives funded by £330,000 in grants from Manchester Health and Care Commissioning. Ms Hall, a former mental health nurse, says the project helps patients break down barriers and start conversations. "A lot of the session is non-verbal - and people can just sit and spend time with the animals enjoying a quiet bond," she says, adding that the feedback so far has been "quite magical". The novel therapy even appeals to disengaged patients. Occupational therapists at the hospital say the sessions are attracting men who wouldn't normally get involved in group activities. Playing with Moose - a King Charles Cavalier Spaniel puppy - helped Ms Hall cope with the grief of losing her parents, prompting her to set up Noah's ART. Moose is now used in the sessions along with Maggie - a Jack Russell - rabbits, guinea pigs, rats and even a mouse. "When people can enjoy animals it can be that small ray of light that gives hope for enjoying other things in life too," Ms Hall added.